Climate: Tropical; hot, semi-arid; rainy and dry seasons. Nationality: Noun — Timorese; adjective — Timorese. Languages: Portuguese, Tetum (official languages); English, Bahasa Indonesia (working languages). Health: Life expectancy (2010): 62 years. Child mortality rate (2010; under 5) — 64 per 1,000 population. Independence (from Portugal): November 28, 1975. Restoration of independence: May 20, 2002 (see History section). Branches: Executive: president (head of state), prime minister (head of government), cabinet. Legislative — unicameral parliament. Judicial — Supreme Court and supporting hierarchy. The Supreme Court has not yet been formed; the Court of Appeal functions on an interim basis as the Supreme Court. Major political parties: Revolutionary Front of Independent East Timor (FRETILIN), National Congress for Timorese Reconstruction (CNRT), Democratic Party (PD), Social Democratic Party (PSD), Timorese Social Democratic Association (ASDT), National Unity Party (PUN), People's Party of Timor (PPT), Klibur Oan Timor Asuwain (KOTA), National Union of Timorese Resistance (UNDERTIM), and Frenti-Mudanca. GDP (non-oil, 2010 est. ): $636 million. GDP per capita (nominal, non-oil, 2010 est. ): $597. GDP composition by sector (2010): Services 55%, agriculture 32%, industry 13%. Industry: Types: oil and natural gas, coffee. Trade: Exports: oil and natural gas, coffee. Major markets — Australia, Japan, United States. Imports — basic manufactures, commodities. Major sources — Australia, China, Indonesia, Singapore. Timor-Leste is located in Southeast Asia, on the southernmost edge of the Indonesian archipelago, northwest of Australia. 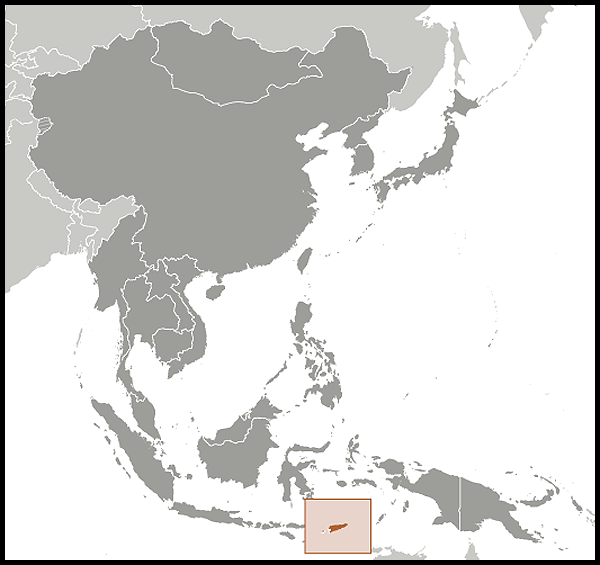 The country includes the eastern half of Timor island as well as the Oecussi exclave in the northwest portion of Indonesian West Timor, and the islands of Atauro and Jaco. The mixed Malay and Pacific Islander culture of the Timorese people reflects the country's location at the juncture of those two cultural areas. After centuries of Portuguese colonial rule, a substantial majority of the population identifies itself as Roman Catholic. Some of those who consider themselves Catholic practice a mixed form of religion that includes local animist customs. Approximately 50% of Timorese speak Portuguese, 55% speak Bahasa Indonesia, and 31% speak English, according to the 2010 census; the percentages are likely significantly lower among adults. Over 85% speak Tetum, the most common of the local languages; about 45% speak Tetum Prasa, the form of Tetum dominant in the Dili district. Mambae, Kemak, and Fataluku are also widely spoken. This linguistic diversity is enshrined in the country's constitution, which designates Portuguese and Tetum as official languages and English and Bahasa Indonesia as working languages. Portuguese and Dutch traders made the first western contact with Timor in the early 16th century. Sandalwood and spice traders as well as missionaries maintained sporadic contact with the island until 1642, when the Portuguese moved into Timor in strength. The Portuguese and the Dutch, based at the western end of the island in Kupang, battled for influence until agreeing to the present-day borders in 1906. Imperial Japan occupied East Timor from 1942-45. Portugal resumed colonial authority over East Timor in 1945 after the Japanese defeat in World War II. Following a military coup in Lisbon in April 1974, Portugal began a rapid and disorganized decolonization process in most of its overseas territories, including East Timor. 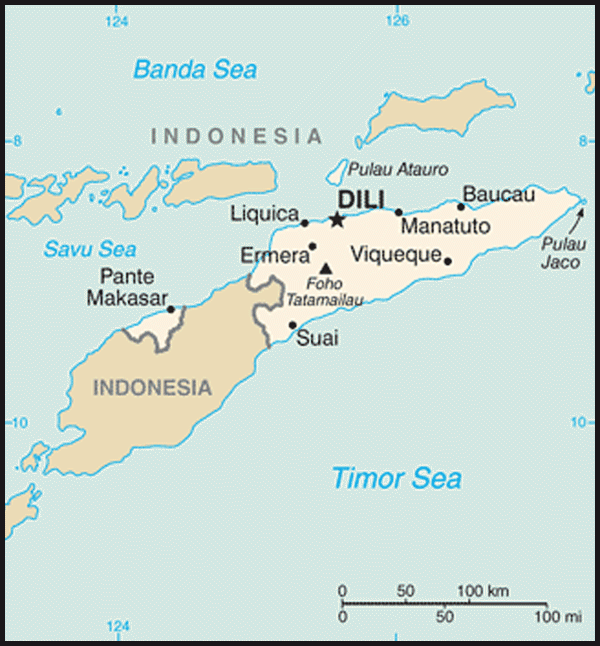 Political tensions — exacerbated by Indonesian involvement — heated up, and on August 11, 1975, the Timorese Democratic Union Party (UDT) launched a coup d'etat in Dili. A brief but bloody civil war followed, and the Revolutionary Front for an Independent East Timor (FRETILIN) pushed UDT forces into Indonesian West Timor. Shortly after the FRETILIN victory in late September, Indonesian forces began incursions into East Timor. On October 16, five journalists from Australia, Britain, and New Zealand were murdered in the East Timorese town of Balibo shortly after they had filmed regular Indonesian army troops invading East Timorese territory. On November 28, FRETILIN declared East Timor an independent state, and Indonesia responded by launching a full-scale military invasion on December 7. On December 22, 1975 the UN Security Council called on Indonesia to withdraw its troops from East Timor. Declaring a provisional government made up of Timorese allies on January 13, 1976, the Indonesian Government said it was acting to forestall civil strife in East Timor and to prevent the consolidation of power by the FRETILIN party. The Indonesians claimed that FRETILIN was communist in nature, while the party's leadership described itself as social democratic. Coming on the heels of the communist victories in Vietnam, Cambodia, and Laos, the Indonesian claims were accepted by many in the West. Nonetheless, the widespread popular support shown for the guerilla resistance launched by the Timorese made clear that the Indonesian occupation was not welcome. In the absence of a legitimate act of self-determination, the United Nations never recognized the incorporation of East Timor into Indonesia. The Indonesian occupation of Timor was initially characterized by a program of brutal military repression. Beginning in the late 1980s, however, the occupation was increasingly characterized by programs to win the "hearts and minds" of the Timorese through the use of economic development assistance and job creation while maintaining a strict policy of political repression. Serious human rights violations — such as the 1991 Santa Cruz massacre — continued. Estimates of the number of Timorese who lost their lives to violence and hunger during the Indonesian occupation range from 100,000 to 250,000. On January 27, 1999, Indonesian President B.J. Habibie announced his government's desire to hold a referendum in which the people of East Timor would choose between autonomy within Indonesia and independence. Under an agreement among the United Nations, Portugal, and Indonesia, the referendum was held on August 30, 1999. When the results were announced on September 4 — 78% voted for independence with a 98.6% turnout — Timorese militias organized and supported by the Indonesian military (TNI) commenced a large-scale, scorched-earth campaign of retribution. While pro-independence FALINTIL guerillas remained cantoned in UN-supervised camps, the militia and the TNI killed approximately 1,300 Timorese and forcibly relocated as many as 300,000 people into West Timor as refugees. The majority of the country's infrastructure, including homes, irrigation systems, water supply systems, and schools, and nearly 100% of the country's electrical grid were destroyed. On September 20, 1999, Australian-led peacekeeping troops of the International Force for East Timor (INTERFET) deployed to the country, bringing the violence to an end. Timor-Leste became a fully independent republic with a parliamentary form of government on May 20, 2002, after approximately two and a half years under the authority of the UN Transitional Administration in East Timor (UNTAET). The country's first parliament was formed from the 88-member Constituent Assembly chosen in free and fair, UN-supervised elections in August 2001. The FRETILIN Party won the majority of Assembly seats. Mari Alkatiri, FRETILIN's Secretary General, became the first Prime Minister, and FRETILIN dominated the country's 29-member cabinet. Xanana Gusmao was elected in free and fair elections on April 14, 2002 as President. UNTAET's mandate ended with East Timor's independence, but a successor organization, the UN Mission for the Support of East Timor (UNMISET), was established to provide additional support to the government. UNMISET's mandate expired on May 20, 2005 after the UN Security Council unanimously approved the creation of a small special political mission in Timor-Leste, the UN Office in Timor-Leste (UNOTIL), to take its place. Under the constitution ratified in March 2002, "laws and regulations in force continue to be applicable to all matters except to the extent that they are inconsistent with the Constitution." The Government of Timor-Leste has enacted a significant amount of legislation, including criminal and procedure codes. In February 2006, approximately 400 military personnel (from a total military strength of 1,400) petitioned President Gusmao to address their complaints of discrimination. The commander of the country's armed forces (F-FDTL) dismissed the petitioners, who reacted with a demonstration that flared into violence on April 28. In response to the escalating unrest, large numbers of people began to flee their homes for internally displaced persons (IDP) camps or the outlying districts. The violence mounted with a series of deadly clashes among the F-FDTL, dissident military forces, civilians, and some police occurring on May 23-25. Mob and gang violence took over the capital, resulting in additional deaths, widespread destruction of property, and the continued displacement of thousands of Dili residents. At the peak of the crisis, there was a national total of about 150,000 IDPs. Facing a full-scale collapse of civil order, the Government of Timor-Leste on May 28 asked the Governments of Australia, Malaysia, New Zealand, and Portugal to send security forces to stabilize the country. Under heavy domestic political pressure, Prime Minister Alkatiri resigned on June 27. Jose Ramos-Horta — the Foreign and Defense Minister in the Alkatiri government — became Prime Minister on July 10, and a new cabinet was sworn in on July 14, 2006. Timor-Leste held presidential elections in the spring of 2007. On April 9, voters chose from a slate of eight candidates. With a voter turnout of almost 82%, the top two finishers were the FRETILIN Party candidate Francisco "Lu-olo" Guterres, who received 28% of the vote, and Jose Ramos-Horta, who received 22% of the vote after stepping down as Prime Minister to run as an independent candidate with the endorsement of then-President Xanana Gusmao. In the runoff election on May 9, required because the electoral law specifies that a candidate must win a majority, Ramos-Horta won by a landslide, receiving 69% of the vote. The presidential elections experienced some procedural glitches, but were largely free of violence and significant irregularity. The Government of Timor-Leste held parliamentary elections on June 30, 2007. Observers agree that the elections were generally free and fair. FRETILIN won the most seats in parliament, but no single party won a majority and the various parties did not agree to form a national unity government. On August 6, 2007, President Ramos-Horta asked Xanana Gusmao, the leader of a coalition with a majority of the seats in the parliament (the Alliance with a Parliamentary Majority or AMP), to form a government. Gusmao was sworn in as Prime Minister along with most of the other ministers in the new government on August 8, 2007. Although the June elections proceeded in a largely peaceful atmosphere, violent disturbances broke out in several areas of Dili and the eastern districts of Baucau and Viqueque when the president announced the formation of a new government as FRETILIN partisans took to the streets to protest that they had not been given an opportunity to form a government. The unrest subsided within days, but the affected areas remained tense for several weeks thereafter and FRETILIN continues to assert that the AMP government is unconstitutional although it participates actively in the work of the national parliament. Upon taking office, the AMP government put the problems of the internally displaced persons, the petitioners, and other issues flowing from the 2006 crisis at the top of its policy agenda. The Ministry of Social Solidarity launched an IDP reintegration program, including resettlement assistance and financial support, that allowed for the gradual closing of the camps. All but a few of the nearly 150,000 IDPs had returned home or been resettled by July 2010. The government also addressed the grievances of the military petitioners. Accepting monetary compensation, they closed their encampment in Dili and returned to their homes. On February 11, 2008, followers of former military police commander and fugitive Major Alfredo Reinado attacked President Ramos-Horta. Ramos-Horta sustained gunshot injuries and was airlifted to Australia for medical treatment. Prime Minister Gusmao escaped unharmed after his bodyguards thwarted a separate attack against him the same day as the attack on the president. The president's bodyguards killed Reinado. The government, with the approval of the national parliament, immediately imposed a state of siege that temporarily imposed a curfew, curtailed freedom of assembly, and gave security forces greater latitude for arrests and searches. These emergency measures were scaled back as conditions stabilized over the following weeks. President Ramos-Horta returned to Timor-Leste on April 17. The state of emergency was lifted completely when the remainder of Reinado's followers surrendered to authorities on April 29, 2008. Most of them were convicted on March 3, 2010, for their involvement in the assassination attempt. Ramos-Horta subsequently commuted the sentences of the defendants, and they were released. Since 2008, the government has succeeded in maintaining stability throughout the country. Presidential and parliamentary elections are expected to take place the first half of 2012. Timor-Leste is one of the least developed countries in the world, with basic income, health, and literacy levels similar to those of countries in sub-Saharan Africa. Infrastructure is inadequate in urban and rural areas. Unemployment and underemployment combined are estimated to be as high as 70%. Official statistics indicate that around 40% of the country's population lives below the poverty line. Timor-Leste has received oil and gas revenues since 2005 as major projects in the Joint Petroleum Development Area that Timor-Leste shares with Australia have come online. The government set up a special Petroleum Fund in 2005 to ensure the sustainable use of its revenues over the long term. Petroleum Fund assets reached $8.3 billion in 2011. The economy is dependent on government spending (financed by petroleum revenues) and assistance from international donors. Private sector development has lagged due to human capital shortages, infrastructure weakness, an incomplete legal system, and an inefficient regulatory environment. Timor-Leste joined the United Nations on September 27, 2002. It is pursuing membership in the Association of Southeast Asian Nations (ASEAN) and became a member of the ASEAN Regional Forum (ARF) in July 2005. Timor-Leste's foreign policy places high priority on its relationships with Indonesia; neighbors such as Australia, Malaysia, and Singapore; and friendly countries and donors such as the United States, China, the European Union, Japan, and Portugal. Timor-Leste and Indonesia have full diplomatic relations. In 2005, Indonesian President Susilo Bambang Yudhoyono visited Timor-Leste; his itinerary included a visit to the Santa Cruz cemetery in Dili where Indonesian troops had killed at least 75 Timorese and injured hundreds of others in 1991. After the 2004 Indian Ocean tsunami devastated parts of Indonesia, the Government of Timor-Leste contributed humanitarian assistance. Likewise, the Indonesian Government sent humanitarian assistance to help those displaced by the unrest in Dili in 2006. After assuming office in May 2007, President Ramos-Horta traveled to Jakarta for his first state visit abroad. When former President Suharto died in January 2008, Prime Minister Gusmao and other senior officials traveled to Indonesia to pay their respects. In August 2011, Indonesia and Timor-Leste signed a bilateral defense memorandum of understanding. In 2005, Indonesia and Timor-Leste created a bilateral Truth and Friendship Commission (TFC) in order "to establish the conclusive truth in regard to the events prior to and immediately after the popular consultation in 1999, with a view to promoting reconciliation and friendship, and ensuring the non-recurrence of similar events." In July 2008, Indonesian President Susilo Bambang Yudhoyono, Prime Minister Xanana Gusmao, and President Jose Ramos-Horta met in Bali to receive the TFC's report and to endorse its recommendations. The report acknowledged that abuses had been committed by persons on both sides of the conflict, and assigned "institutional responsibility" for human rights violations to the armed forces of Indonesia. While some critics fault the report's failure to press for accountability on the part of individual Indonesian civilian and military leaders, supporters endorse the report's recommendations for measures to promote reconciliation between the two countries. Such issues of past abuses and accountability are continuing challenges in the countries' bilateral relationship. The United States and Timor-Leste enjoy excellent bilateral relations based on shared interests and values. The United States has a large bilateral development assistance program — roughly $25 million in fiscal year 2010 — and also contributes as a major member of a number of multilateral agencies such as the United Nations, Asian Development Bank, and World Bank. U.S. assistance focuses on bolstering stability by strengthening the foundations of good governance, accelerating economic growth, improving the health of the Timorese people, and supporting the professionalization of the Timorese security forces. Aid from the United States to Timor-Leste from 2000-2010 totaled over $300 million. Timor-Leste maintains an embassy in Washington, DC and a Permanent Mission in New York at the United Nations. The U.S. Embassy (http://timor-leste.usembassy.gov/) in Timor-Leste is located at Praia de Coquieros, Dili; tel: 670-332-4684, fax: 670-331-3206.